Hello again! I hope everyone is having a good weekend. I thought I would share some of the other upgrades I made while doing my SAS not to long ago. 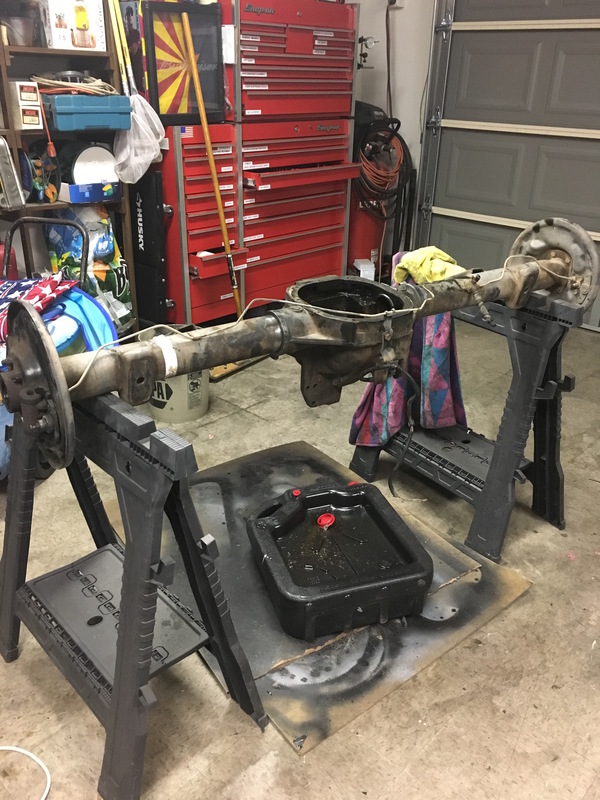 The front axle I used for my SAS is an HD D44 from a '79 F-250. It originally came with 8 lug outers, I needed to stay 5 lug. I really liked the burly parts of the 8 lug outers in comparison to the Ford 5 lug outers or even a Ford/Chevy parts setup. The 8 lug has beefy flat top knuckles, dual piston caliper brakes, the large inner wheel bearing, a stout spindle and large hub. This combination beef platter is not available in 5 lug. As I said before I like challenges and to tinker so I set out to come up with something that had all that in 5 lug. What I came up with was a Ford/Dodge hybrid. It took some work but "inventing" is fun and I like the feeling of accomplishment when it all comes together and works. Here is a picture of my outer setup. Ford flat top knuckles, large inner wheel bearing spindle, and dual piston calipers. 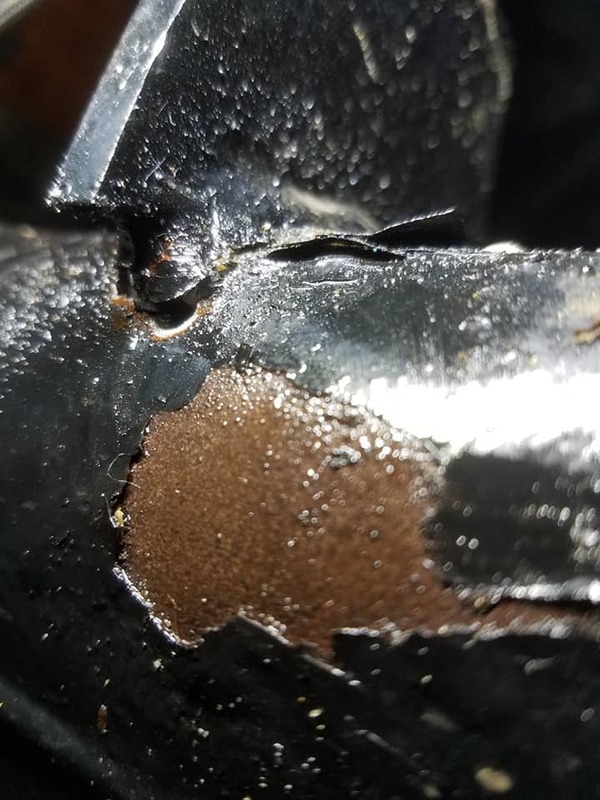 The hub is from a mid 80's Dodge Ramcharger that uses the same large inner wheel bearing, same outer wheel bearing and this hub is beefier than the Ford 5 lug hub. To get the Dodge hub to match the Ford spindle length I had to have a machinist turn down the outer bearing seat by .25" inside of the hub. 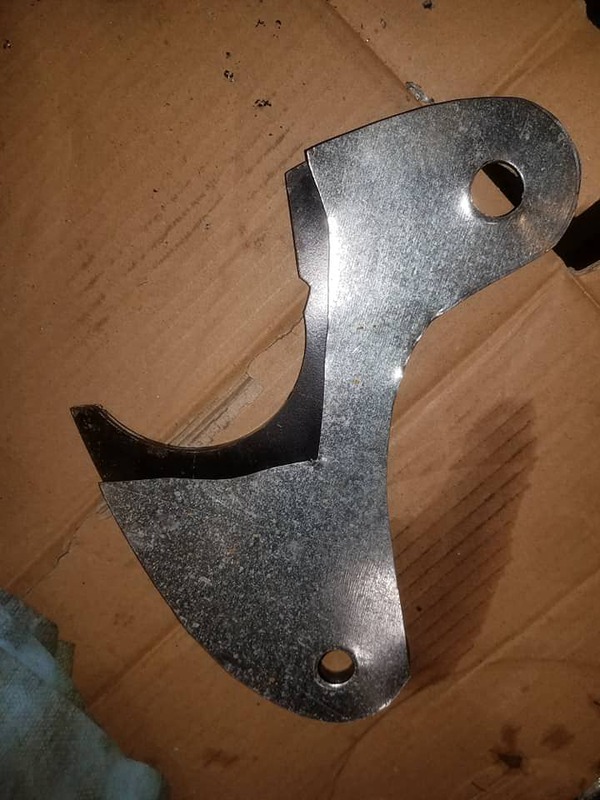 The next challenge was finding brake rotors that would fit. I found out that '02 Ram rotors were 5 lug and big enough around to fit my dual piston calipers, just a little to big though.Those required some machining down of the outside diameter to fit, the Ram rotors also use 9/16" lug studs so I drilled the hubs to fit 9/16" lugs. Everything fit together perfect in the end. For the brake lines I used stainless braided lines to the calipers, ran all new hard lines from the master cylinder and deleted the ABS pump. My brakes work and feel amazing, light years ahead of what I had prior! 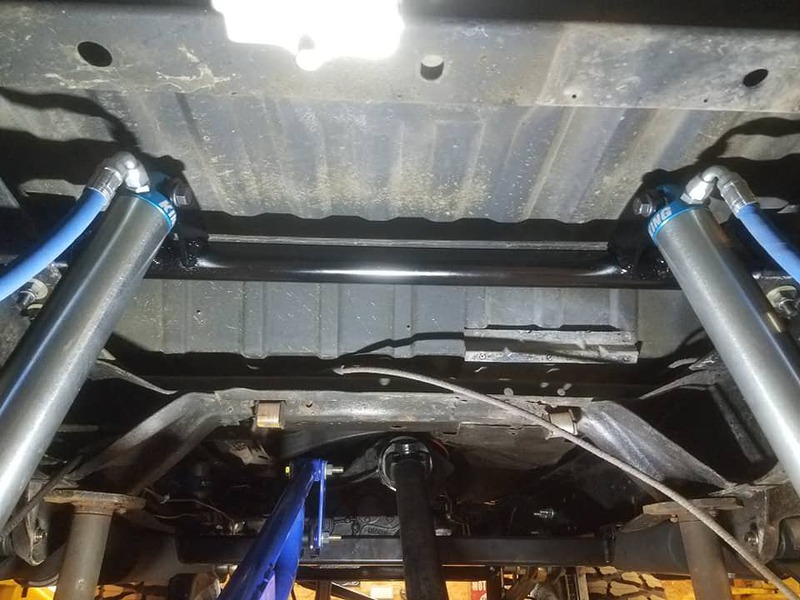 One last thing I did to compliment the new suspension was the installation of poly body mounts. WOW...I didn't think a Bronco could NOT rattle going down the road. Its quiet in my cab now, amazing! That's it for now. Have a good afternoon Bronco heads! How about a Sunday double post! Went out with the family this morning to try and get some Bronco videos. We went behind the airport up Mingus Mountain here in Cottonwood,AZ. I haven't been to this area for maybe a couple years now and unfortunately a lot has changed. Many of the 4wd side trails have been closed off and the BLM did major reclamation of an old shooting range which really screwed up my plans, the spots I wanted to shoot some video at were closed. A major buzzkill on some fun close by spots . So we headed up to a hill climb I hoped would still be open and it was. The tougher ones were all blocked off but this was still fun, I remembered this hill being bigger and more difficult but that was pre suspension upgrade. Some pictures from the top. Over looking Cottonwood. Flagstaff and the San Francisco Peaks way off in the distance. Looking up at Mingus Mtn. BikerPepe`, BigBlue 94, anaconda and 6 others like this. Good evenin' on this Sunday fun day, i left you coming into another season ender and modification beginner. 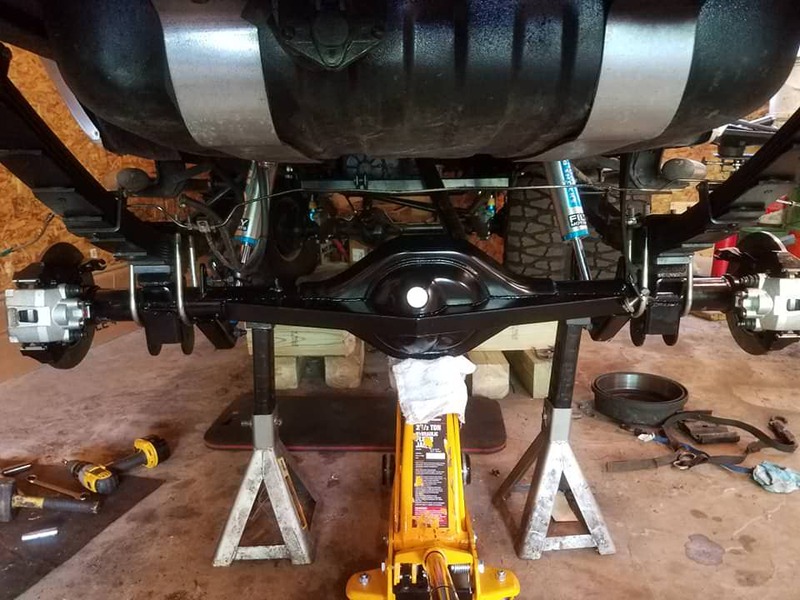 So the next thing I wanted to tackle was setting up my rear suspension to handle like the front suspension. 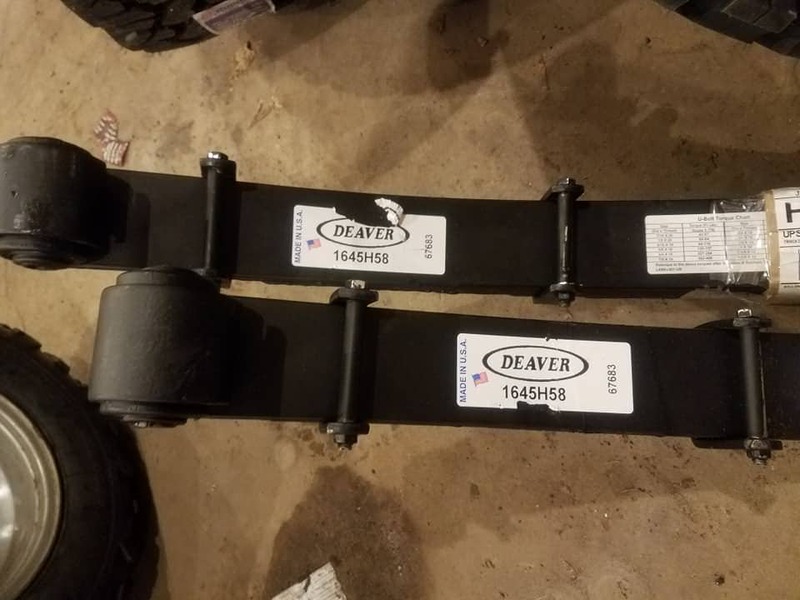 Wheel travel and ride quality are always on the top of the list, so again I went with a Deaver spring, The Deavers use multiple thinner leafs to give a softer ride and offer more flex. In comparison, the Superlift leaf packs I removed contained 3 thick leafs whereas the Deaver packs contain 10 thin leafs. 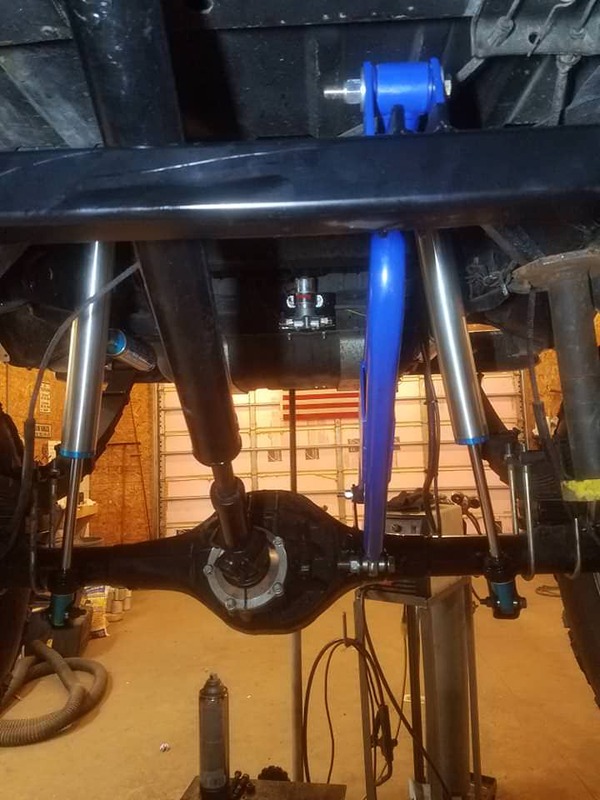 During the change, I installed new rear shackles as well because the bushings in the old ones didn't survive the air time from the summer. Next step was shocks, and to match the front I went with a King 2.5" resi shock. One thing I have learned when it comes to wheel travel and softening a landing, you want as much shock travel as you can get. 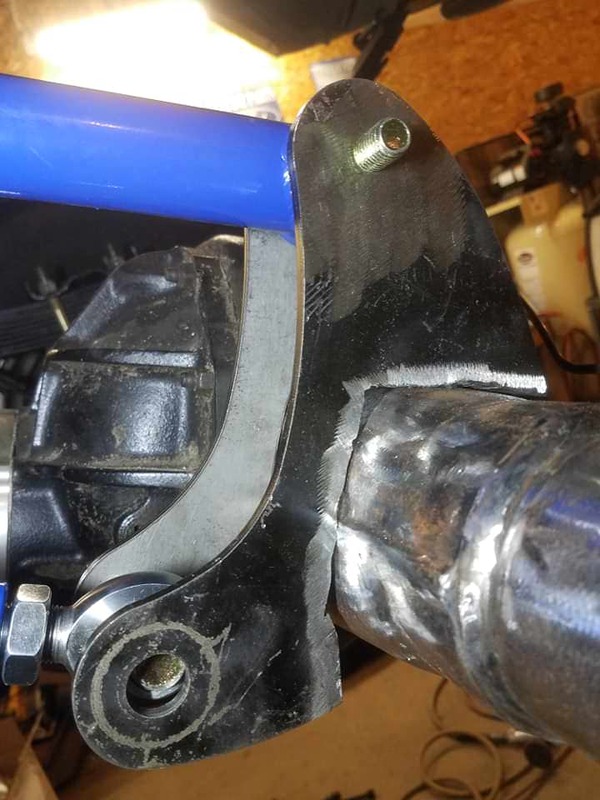 To increase shock length and add travel I had to custom fab an upper mount and get rid of the factory frame mounts. 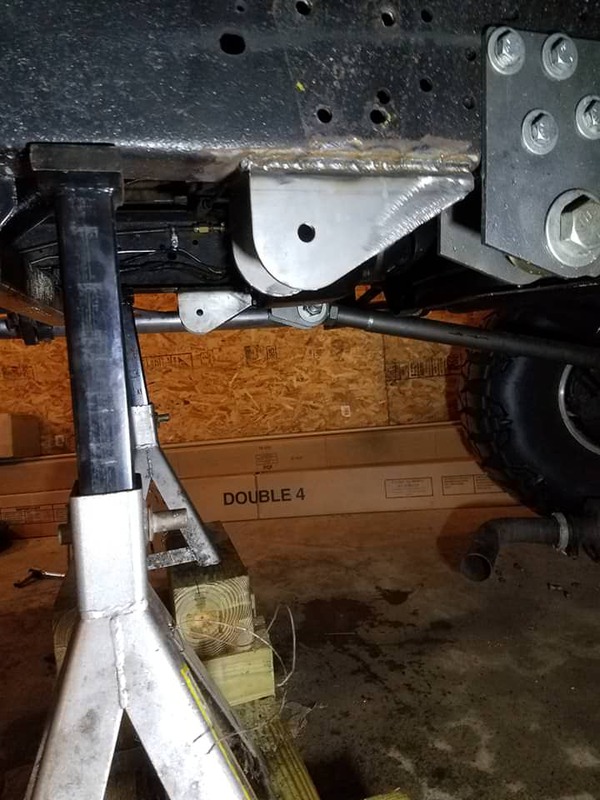 Fortunately, just above and forward of the factory mounts there is a nice bump up in the floor pan that is the perfect location for a cross member. For this I used a section of 2' 1/4 wall DOM tubing and some shock tabs I ordered from RuffStuff Specialties. 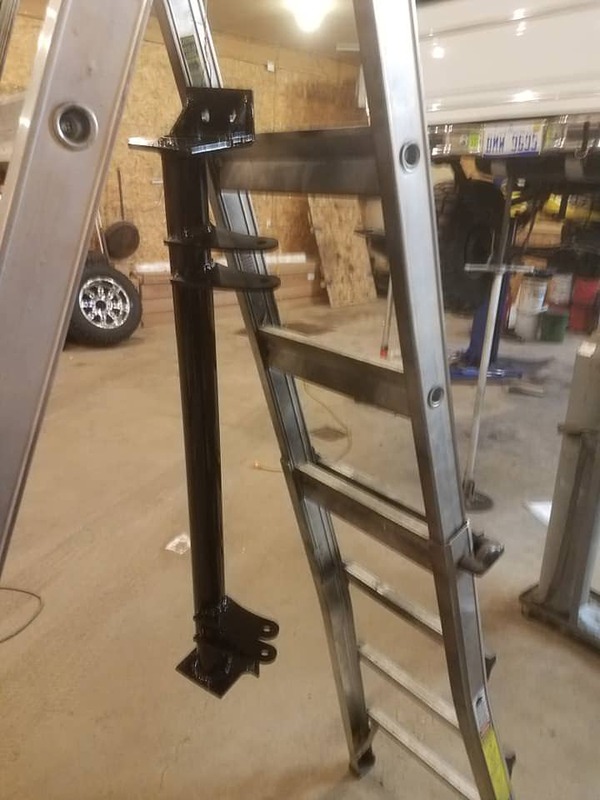 You may have noticed a pattern in my build, everything I fabbed for suspension is bolt on and completely removable should I decide to change it up again down the road, so this new mount was designed to bolt to the top of the frame rails. Since I planned ahead for more air time, I also upgraded the mounts on the housing to something much beefier from RuffStuff Specialties. 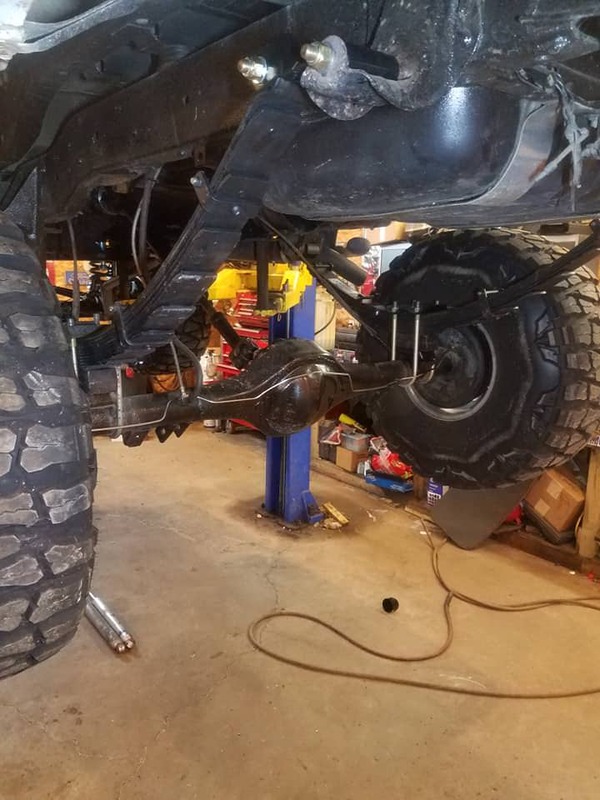 You may recall that I had slight issues climbing hills with the stock axles, so I shipped it off to a local drive line shop, checkbook in hand and had the front and rear axles fully upgraded. 4.56 gears, 35 spline Detroit Tru-trac diff in the rear with a Nodular third member, Ford trac-lok diff in the front, and chromoly shafts all around. Now it was set up to handle the power and put it to the ground. With the axles finished, it was on to traction control. As you can imagine, 600+ hp and 38" Grapplers tends to make things move in strange ways, so I originally installed a set of L&L ladder bars. The ladder bars worked great and kept the rear housing squared up, BUT, they were actually horrible. The biggest problem with the L&L bars on an off road rig, is wheel travel. 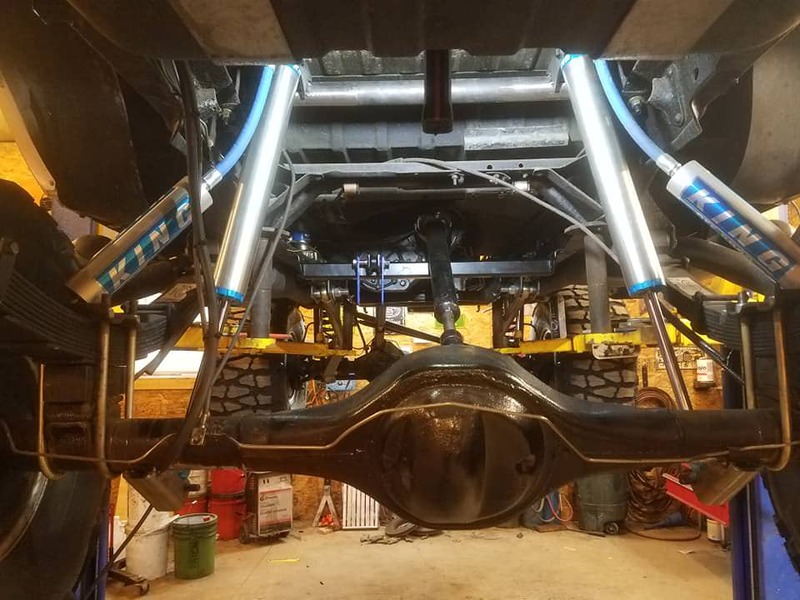 The bars are designed to hold a fixed point on the axle housing and at the frame, and the suspension is designed so that the axle will move in an arc when it drops meaning that it moves down and forward. 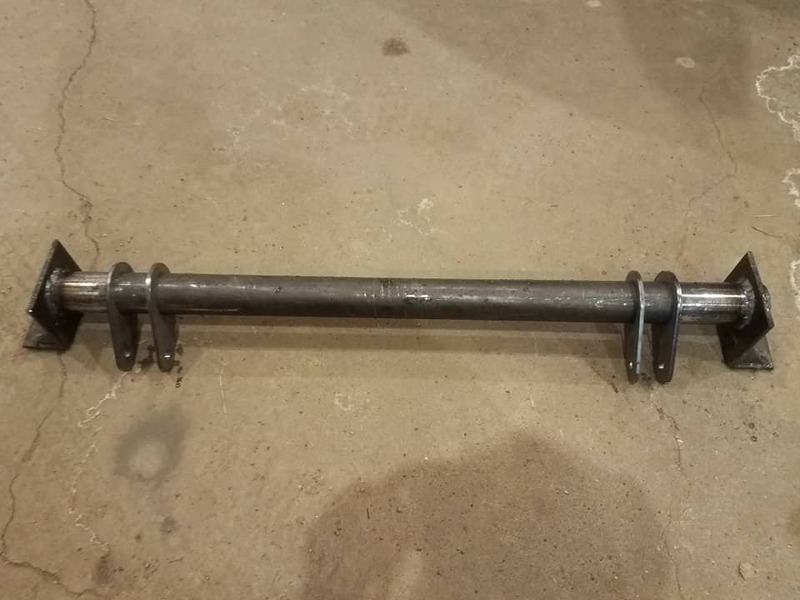 The ladder bars would tend to bind everything and limit wheel travel which was a problem with the new suspension. To fix this I went to James Duff who offers their Torque Tamer. The Torque Tamer is designed to have a single fixed point on the axle housing and use a shackle, or pivot, to mount on the chassis. Now the Torque Tamer is kind of a 'one size fits all'(with modification) kind of part, lol. Long story short, the instructions were lacking and the it was a pain to get installed. The axle mounting plate that has to be welded on, also has to be trimmed to fit the housing. 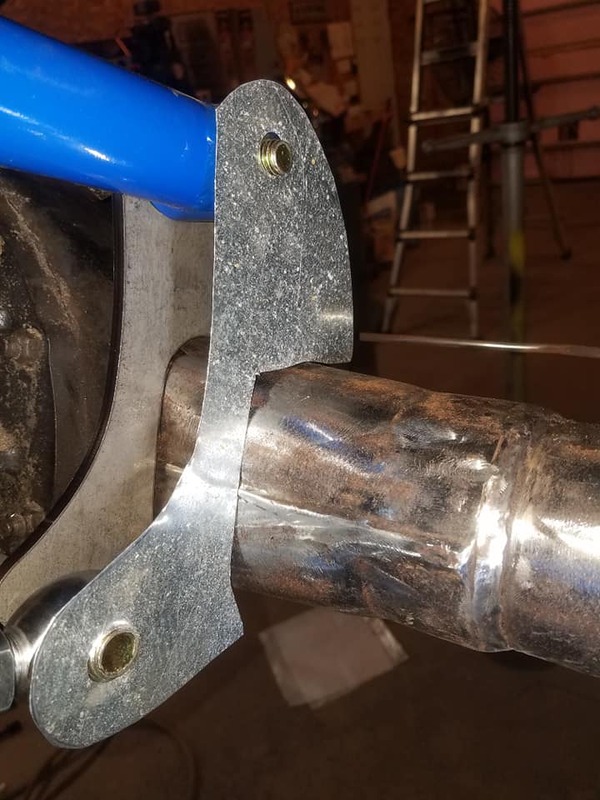 I ended up playing the guessing game and used a thin piece of sheet metal as a template to shape the mount and get it welded on. So Spring time hit and we planned our first 'test' for Memorial weekend of this year. I was excited to put these new upgrades to the test, so we loaded up and headed for the sand. First impressions were everything, and I was pretty pleased with the results, the new lockers and gears helped climbed the hills with ease. The new suspension was riding soooo much better and the extra wheel travel was noticeable. The Bronco seemed to be coming together as I planned it, however, things are not always as they seem. So, I first noticed there was a problem when leaving the sand dunes and hitting the pavement. 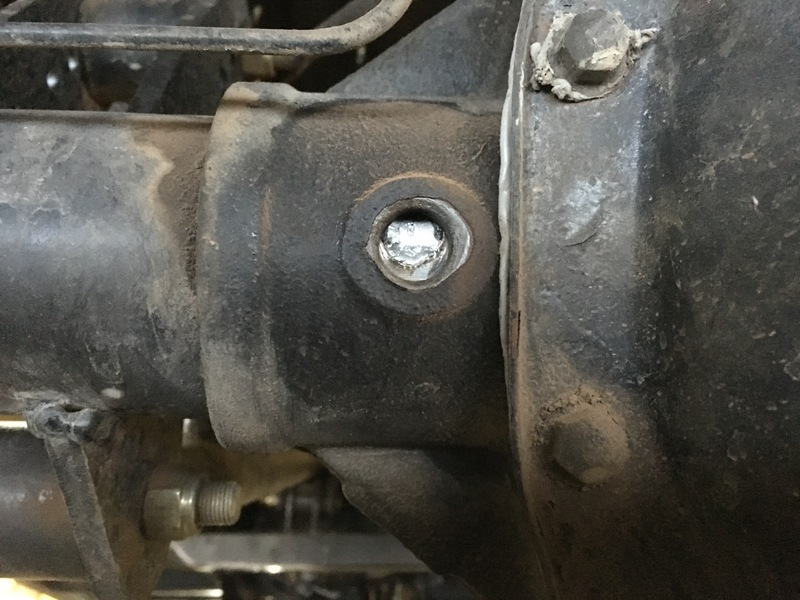 The first sign was a vibration, which I had experienced this symptom in the past, it was caused by a damaged double cardon joint in the rear driveshaft, no biggie, just fix it when I get home... right? Well, after being home for a few days I headed to the garage to pull the driveshaft, and that's when I saw it, gear oil on the garage floor. 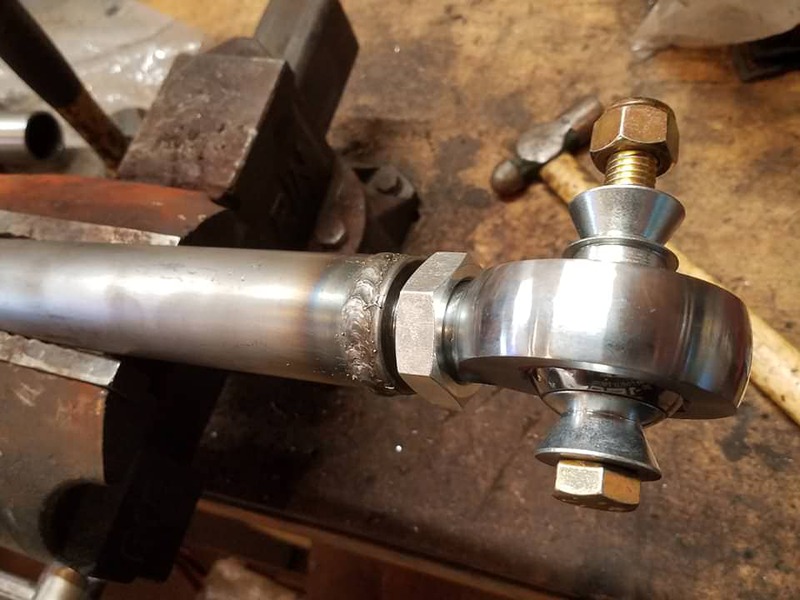 Turns out the Torque Tamer worked so well at holding the axle housing in place, the housing actually twisted next to the mount welded on the housing tearing a hole into it and bending the entire housing. So I've gotten to the 'interesting' part, it leads into more upgrades and expenses that Ill get to in my next post. Here's a bit of teaser pic to get you guessing on what happens next. FSB! Once again I would like to give thanks for the F.O.T.M opportunity. Ive got plenty more to share about wheeling and playing in the rocks but tonight Ill share my constant project as it stands. When I got it home I investigated the unit and its actually in great shape, I tore it down in prep for a truss. This time Ill do best practices with a jig so I don’t need to worry about alignment. I think the F.O.T.M will be done prior to completion so this may be the only post regarding the battle but this is my latest pickle and thought I would share. To wrap up this post, heres a local trail picture for fun! Good evening everyone! Going to be a quick post tonight. With having all new suspension and an SAS, I am now wheeling something far more capable than anything I have had out on trails before. So its a bit of a learning experience, sizing up obstacles to take on is totally different. So here's a quick video from this evening after work of me doing something to learn what I can do now, also doing this kind of stuff is good to check for any issue's with my new setup before going on long trail runs. I cant wait to get out on the rocks! I've got another quick video from last night. I backed down the same ledge trying to show off some suspension flex. 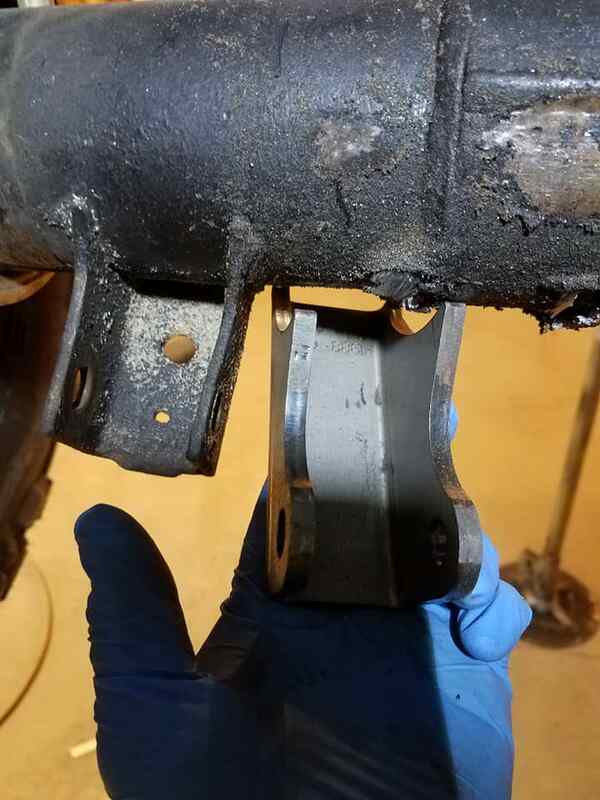 Now that the rear axle was "taco'd" in the Bronco, I went in search of a replacement housing. First stop, was my local Driveline shop, the owner is a good dude and a fellow Bronco enthusiast, lucky for me, he hoards driveline parts. 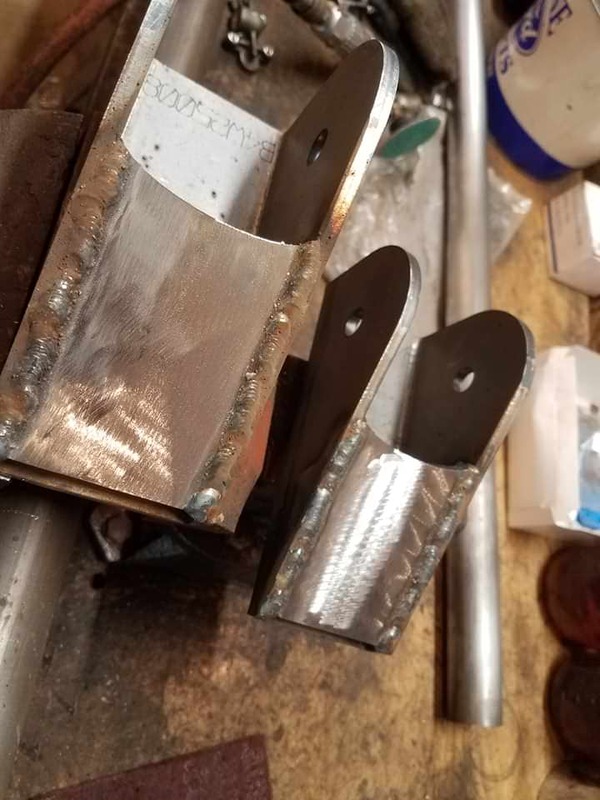 Just so happened he had a few 9" housings in his warehouse, so I stopped in with measurements to get the correct one and was hit with this... "Are you sure you dont want to upgrade to an aftermarket housing?". Crap, I felt my wallet run and hide, lol, but he was right, I've upgraded everything else, wouldnt make sense to use another stock housing. So, I looked through his Moser catalog and next thing I know, I've got a Moser housing, a back truss, and a disc brake conversion kit being shipped in. Next I had to pull the old axle and get it down to them so they can swap everything over. It was a sad sight, this is what I had to look at for a solid month. 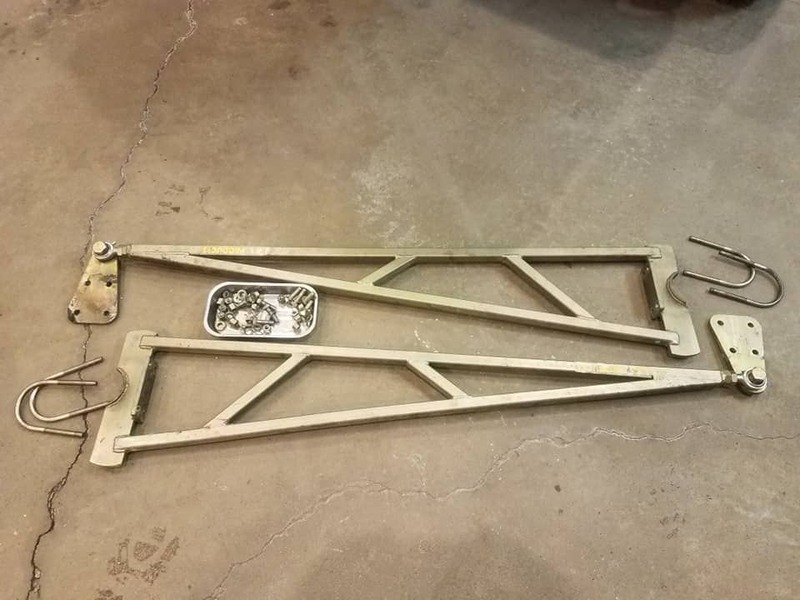 I finally got the call, parts had come in, truss was welded on along with all the mounts and tabs, everything was assembled, and the paint was dry. By this time it was a week before July 4th and our next trip to the 'sand box', so I had some work to do. 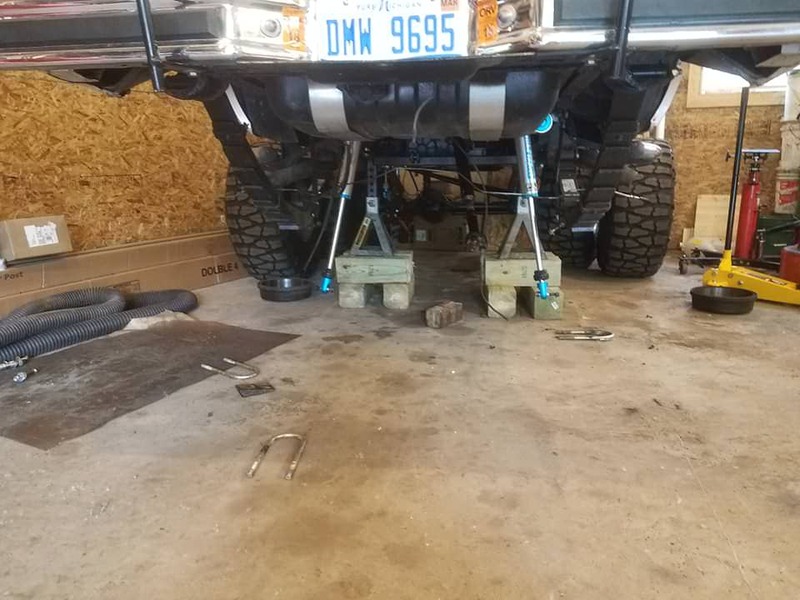 Installing the axle was pretty easy, I only dropped it off the jack twice, lol. 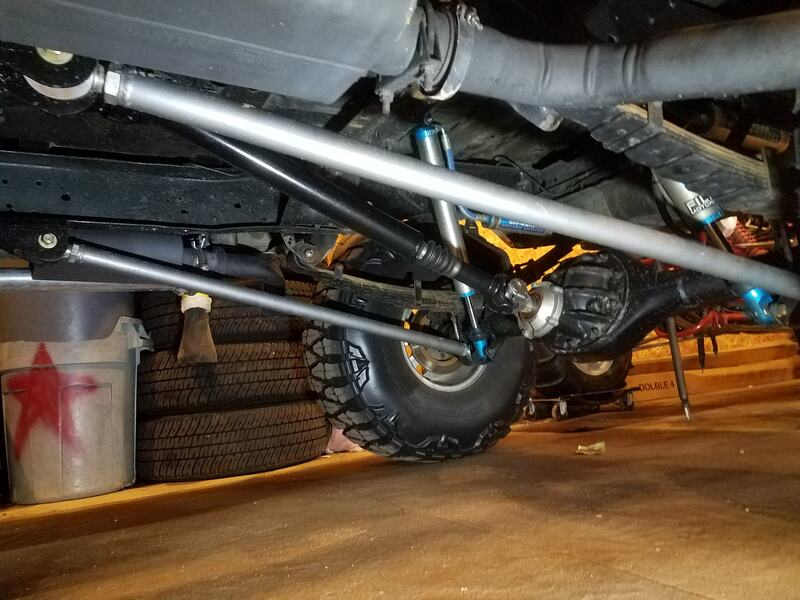 The disc brake conversion presented some challenges, I had to change up my brake lines and add some hoses for each caliper, luckily the rear hoses for a 2000 Ford Explorer fit perfect. Now that the axle was in, I had to focus on traction control again, obviously the Torque Tamer was a fail on my Bronco. The Tamer was a nice piece that performed as designed, it just didn't work well with my set up. 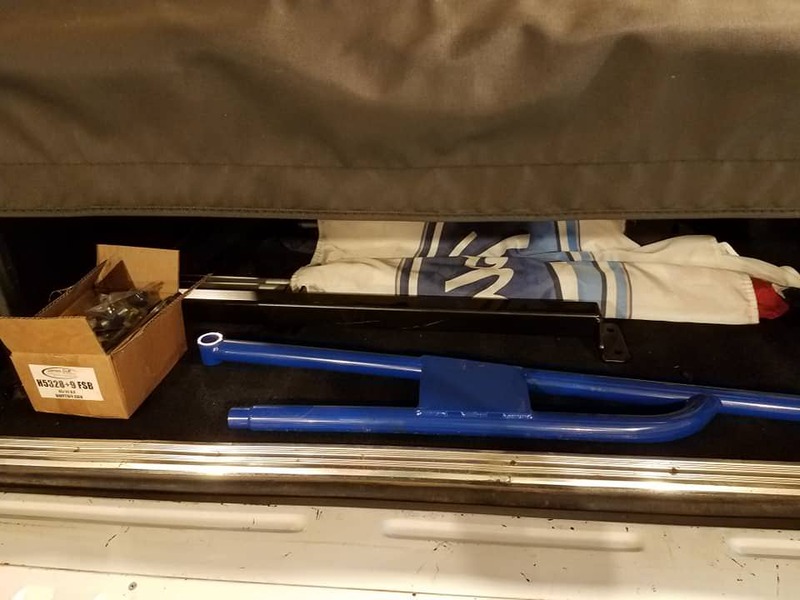 After a lot of research I ended up settling on a heavy duty DIY traction bar kit from Barnes 4Wd. I was a little nervous about how it would perform with my suspension, I did not want to limit travel any more than I had to. Fortunately, they offer the kit with either poly bushings or heim joints, so I opted for the heims. It took some late nights of fab work but I was able to get it all ready for the 4th. Testing went great, turns out the traction bars were exactly what I needed, they articulate well, don't reduce wheel travel at all, and hold the axle square with the chassis when getting into the power. It was another great family weekend of off road fun and nothing broke this time... surprisingly. You probably won't here from me again until the weekend, I've got a little something in the works to finish this thing off... weather permitting. BigBlue 94, anaconda, itwasFREE!!!! and 5 others like this. 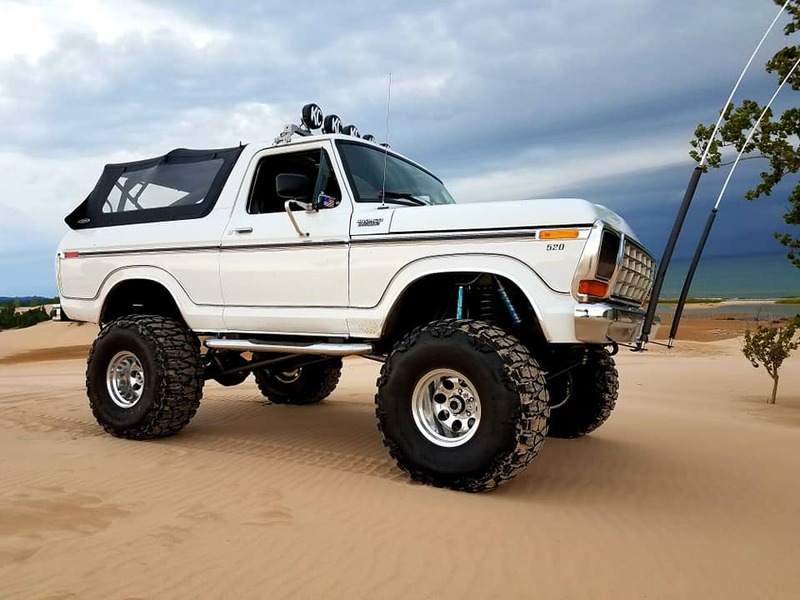 It's been a long day but its looking like my turn to post so here we go, I mentioned earlier this month that my wife feeds me parts for Christmas, Birthdays and such but I didn't mention that she also loves going out in the Bronco. After a while she started wanting to drive more and more so before long I had her tearing up the rocks too, here is a little footage of her out playing.. Okay, better late than never I guess. Hopefully I can get more than just my own vote in this deal. I bought my 96 on ebay from a couple in Utah. It was a police/plow vehicle of some sort, with low-low miles (~84K), so I figured it would have been maintained fairly well, or at least had the oil changed. 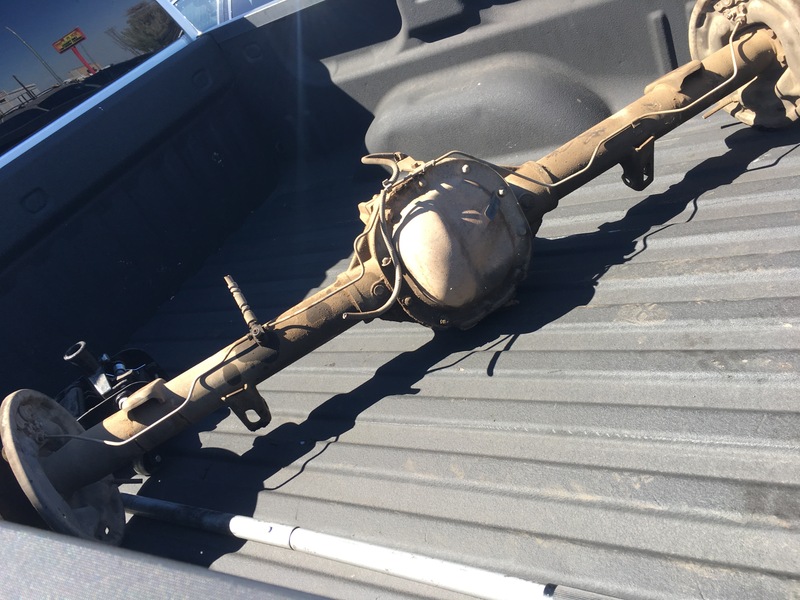 It arrived with more rust than expected, flat tires with tubes in them, and assorted butchery the likes of which I've never seen....but it was actually still a fair deal for the money I paid. This is a picture from the original sale add. New tires were needed immediately, but required some "clearancing". And I had to get rid of those lame running boards right away. Then I installed some better looking steps, and black bumpers....which required some "fitting". Then new shocks, bearings, and fixing a few leaks. Then some light body work, new black wheels, and new fender flares. A few trips with the motorcycle to SW Colorado and Utah. And lately, I've been working on a camping setup with an ARB awning and bed I made myself. BigBlue 94, anaconda, itwasFREE!!!! and 6 others like this. Hope you're enjoying the show! I said Ive got plenty of footage of playing around in the desert here in AZ and I'm running out of time to share it so here you GO! This is a little footage that was taken not long after the SAS was done, trying to creep down a waterfall step at Bulldog Canyon. This area is awesome for our style of rig since the average slightly lifted non-modified Bronco can get to these points or slowly build confidence to larger obstacles. We have a plethora of fun obstacles like this one, here is another one thats on the same trail head just tucked away 100' from the main path. This was taken about a year after the first video in this post. anaconda, itwasFREE!!! !, JGR and 2 others like this. Just a couple days left so let’s show some love and get some votes in . Contestants get to posting not many chances left to post up your pics !!!! 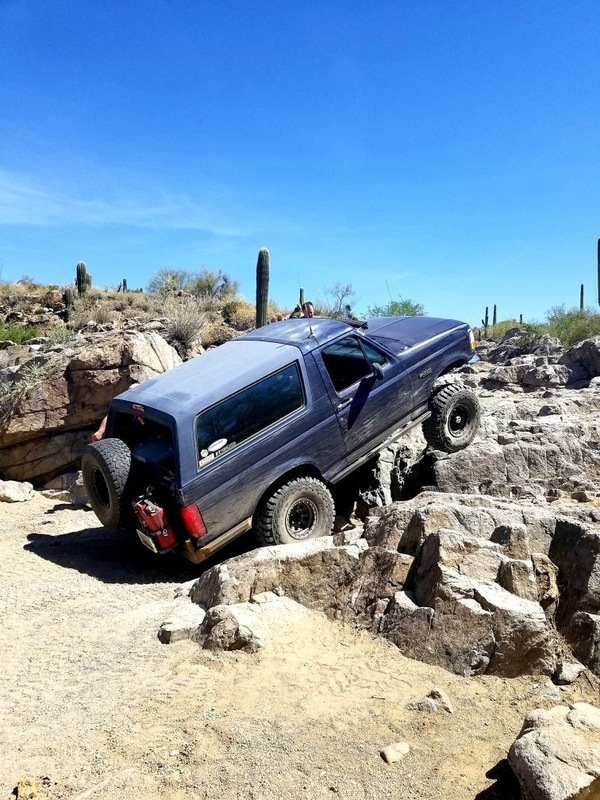 Here's a slightly longer video of an obstacle that is pretty popular around the east valley Phoenix area. The videos never do much justice and the angle doesn't show that this is a 4' undercut solid rock, most rigs need to turn and climb the hill next to it a bit then redirect towards the shelf since you cant take this one head on so theres always a little off kilter action happening and it makes it fun to watch. anaconda, itwasFREE!!! !, Quader1 and 1 others like this. Hey everyone! Hope you all are having a good weekend so far. Looks like we're getting close to the end here. All the contestants have some great Bronco's we have all poured a lot of hard work and dedication into, I can't wait to see who takes it! No matter what the outcome I had a fun time and feel honored just for even being nominated. Now that we have been at this for a month I have pretty much emptied my content tank and have been just too busy to get some new pics and video, so apologies for petering out at the end. Usually doesn't happen to me! I do have some pics from a prospecting trip I took last winter right before starting my SAS and this trip turned out to be a major motivator to get my SAS done, heres why. That was a washed out road from heavy rains the week before, it was a few miles back on a trail to a new placer gold area I wanted to check out. It was a huge disappointment because I had to drive over an hour to get to the trail head and there was no where else close to go so I had to hike a long ways when I got blocked by the washout. To make matters worse, while I was out of the Bronco trying to see if there was a way through the washout a modified Jeep Rubicon came along, he was able to creep down one of the ledges and made it through. Without stacking a lot of rocks there was no way I could have done that in my Bronco at the time and it was a kick in the junk to see a Jeep do it. I told myself no more prospecting until I get the SAS done, so thats what I did! That same trip I came too a neat river crossing. 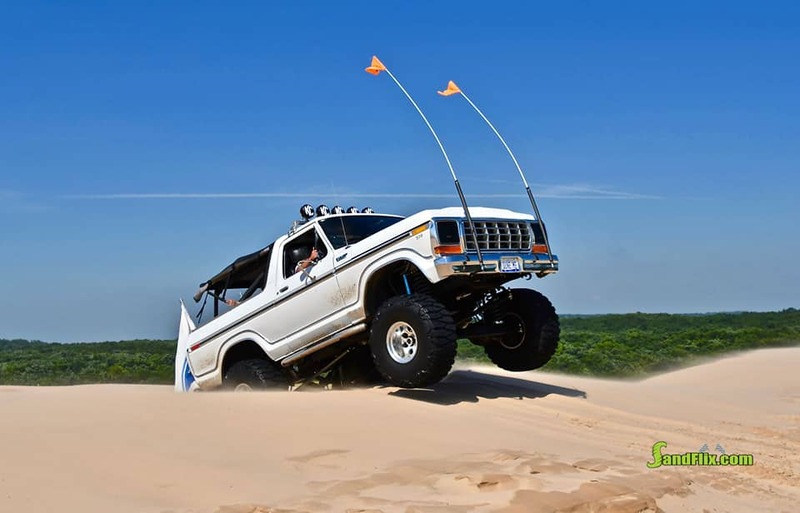 During a totally different prospecting trip I was on a dirt trail coming out to the main dirt road and came to a stop, as I am about to turn and drive away I heard a truck revving up and spinning its tires. There was a large wash not to far off so right away I knew someone was stuck in the sand. I helped recovery these people buried in the wash, his 4wd wasn't engaging. Like the few stuck vehicles I have come across they had no shovel or anything to help themselves get out, he was moving sand with his hands, lol! Gotta do what you gotta do though! The gold gods were shining on me that trip as well. Heres pics of a 2.5 gram nugget I detected in a small wash, its laying in a bedrock pocket and was under just a couple inches of dirt. Same nugget cleaned up some. Thanks for tuning in Bronco fans! Its not over yet so hopefully I can get something else squeezed in here before the end of the month. Have a good weekend! Going to do my final write up tomorrow, but here is a teaser until then. Show some support guys, we need all we can get with only a day left !!!!!! LAST DAY F.O.T.M, for the last time thank you for the opportunity to share my labor and love and truly hope everyones enjoyed the show! Today Im going to share some footage of playing in the MUD, its not like Georgia mud but still pretty damn fun. Im rarely ever the one to drive through it since I avoid the cleaning time but this time was an exception. Heres another short video of lockers and suspension doing the job! I may be doing one more post at the end of the day regarding the winch setup by request but its depending on how much time I get. Good luck to the fellow F.O.T.M nominees!! Very cool rigs this month and since I've never been big on forums FSB has opened me up to looking around more than ever..
Well, final day, and my farewell to FOTM. I was hoping to finish this out with some good pics/videos from my Labor day weekend trip, but the weather had other plans, lol. Rain, rain, and more rain didn't give me a whole lot of time for playing in the Bronco, but I did manage to capture this pic just before the weather moved in off of Lake Michigan. 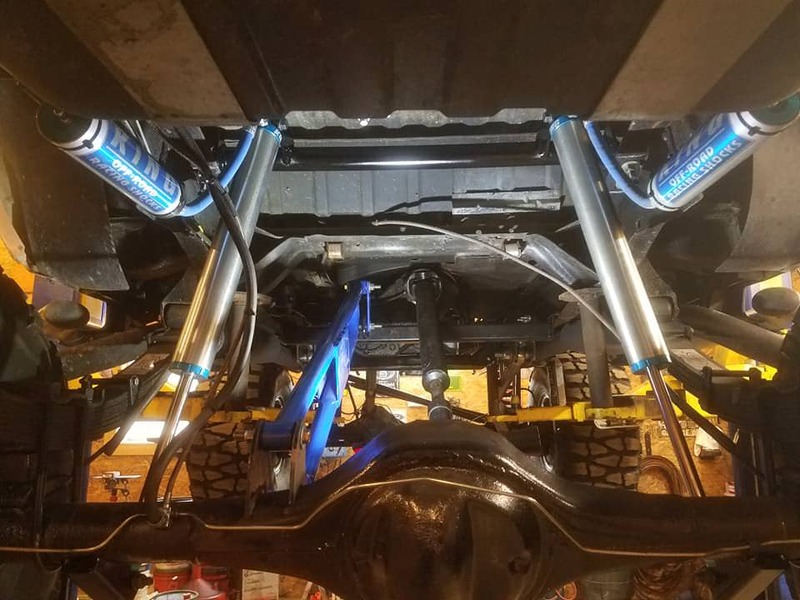 So, hoping to not disappoint, a good friend of mine who owns a diesel performance/repair business was hosting a grand opening at his new shop yesterday and he had a chassis dyno on site. So I loaded up the Bronco and headed out there, the weather was perfect to find out what this thing was putting down. When I arrived, there was massive amounts of black soot being forced into the air by a Cummins diesel on the dyno... I was getting excited, lol. 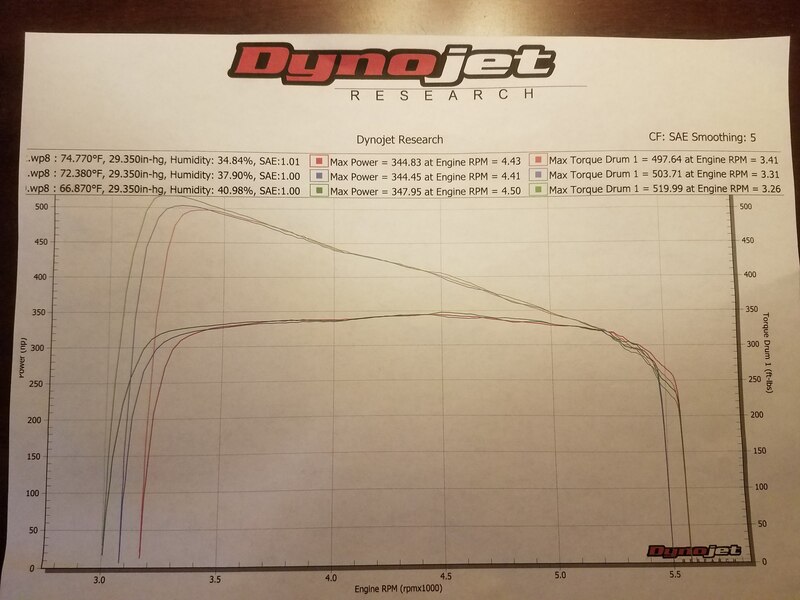 So after talking with the "dyno guy", not sure what his technical name is, it was apparent that I wouldn't be seeing real accurate results due to the over sized tires, but I wasn't deterred. On the rollers we went, with a plan to do 3 pulls, I was sitting in the passenger seat, first time for me, letting someone else wind up my baby. Since i have absolutely no clue how to get a video on here, lol, below is a link to the Youtube video of it on the dyno... maybe I'll get lucky and the video will just show up below. So the numbers came back, and they were definitely not at all what I was expecting, but I am not disappointed in the least bit. Here is the graph from my run. As you can see, the torque numbers are crazy. I was told they figure a 30% drivetrain loss so that would calculate to 450hp and 675 lb/ft of torque at the crank. Certainly these numbers aren't near what was estimated, and I still believe them to be higher than that, but unfortunately, there is no calculation to compensate for the 38" tires so at this point its still an estimating game. So to round out my experience with this competition, I have to admit i had no clue what I was getting into and it is a bit demanding. I have to thank everyone for reading my story and for letting me be a part of this, it was a bit of a learning curve for me since I am also new to the FSB, so I also appreciate your patience. You guys take this seriously and I respect that, my competitors have some great stories and deserve your votes, and if you have decided to vote for me, I give you a very sincere thank you. Good run this month boys! My vote is in. Last edited by Quader1; 10-01-2018 at 12:12 PM.